Last time I started to look at where bond and stock values come from (see Part I). The crucial point, that I’ll explain today, is that a huge amount of the value of any stock derives from decades into the future. Yet market prices often swing around due to short term factors. Understanding this contradiction between short term price levels and long term value is crucial for savvy investors. Any stock analyst worth their salt knows all about the technique of using discounted cash flows to value stocks. I won’t go into the full details of all the formulae, but basically it’s just an extension of the simple examples I described in my last article. The process first involves deciding how much return an investor should want to make for the risk of investing. That could be, say, 9% a year. Next, you make some assumptions about earnings growth rates in coming years. Far out into the future, the rate of profit growth can’t be higher than expected nominal GDP growth rates. This is because no company can grow faster than the economy for eternity. However, the long term growth rate can still be lower than GDP growth in a mature company. In the near term, the growth rates can be higher. That’s if the company looks like it has good prospects to expand over the next, say, 5-10 years. Next you use your earnings projections to work out expected dividends. Those are the actual cash flows that you should receive if you invest in a stock. Once you’ve got all those estimated dividend cash flows, you multiply them by the discount factors relevant for each year in the future. The result is their future values expressed in today’s money. Add up the results, and that’s your estimate of what the stock is worth. 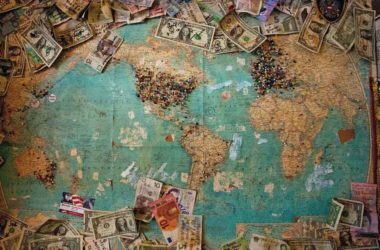 It’s the sum of all future cash receipts, expressed in today’s money, and is known as the present value in finance jargon. You now have a basis to decide whether to buy the stock, assuming you’ve done a decent job and used reasonable assumptions (preferably on the conservative side). 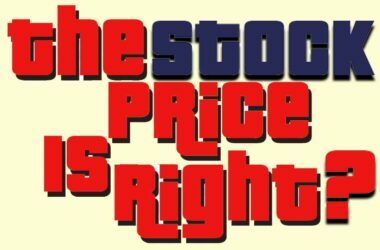 If market price is well above value, avoid the stock (or sell it if you own it, and find better opportunities). If price and value are about the same, expect average returns. If price is well below value, buy the stock in the expectation of a superior return, over time. Whatever kind of company stock you’re valuing, loads of the value derives from cash receipts that won’t happen until way into the future. I’ve done two examples to illustrate. The first example is probably the simplest kind of stock anyone can buy. This is a real estate investment trust (REIT), which is just a company that owns and maintains rented real estate of some kind, usually with a bit of debt financing. Because there’s some debt in the company, adding leverage, the net asset value of the company (assets less debt) goes up slightly faster than inflation. Hence so do the earnings and dividend payments. In my example, I’ve assumed 5% dividend yield and 3% growth of dividends (and hence annual increase in the value of the stock). That gives a total annual return of 8%. This is pretty typical of a REIT, and also the kind of return that REIT investors should expect to get in the long run. Even in this steady, relatively low risk example, it turns out that most of the present value of the future dividends is far out into the future. In fact, 78% is beyond 5 years, 61% beyond 10 years, 48% beyond 15 years and 37% beyond 20 years into the future. Now let’s turn to a more extreme example, what I’ll call a “high-growth hot stock”. You know the kind of thing. Companies with currently high revenue growth rates, minimal or non-existent profits, and not yet paying any kind of dividend. 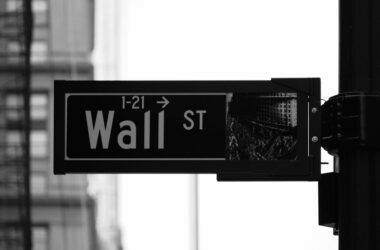 Real life example include things like: Netflix (NASDAQ:NFLX) with its P/E of 227, or Amazon (NASDAQ:AMZN) with its P/E of 238, or Tesla (NASDAQ:TSLA), with no P/E since it’s loss making. These are the sorts of stocks that are priced for perfection. My example hot stock also doesn’t pay a dividend yet, but will start to in future, as it matures. The payout ratio increases in stages, from 0% of profits today to an eventual 40% in 20 years time. I assume profits grow at 25% a year in the first five years, then 20% for 5 more years, 15% for another 5 years, 10% for a further five years, and eventually settling into 4% a year after the 20th year. (Remember: no company can grow faster than GDP forever). The result over the first 20 years is that profits go up by a factor of 25 times. The stock starts higher risk and ends up lower risk. So I’ve discounted the cash flows at an average 12% for the first 20 years, and 8% after that. It turns out, once the values have been calculated, the stocks starts with a high P/E of 55.3 with no dividend yield. After 20 years, it has a modest P/E of 10.4 and 4% dividend yield. But what’s really staggering is where the value is derived. 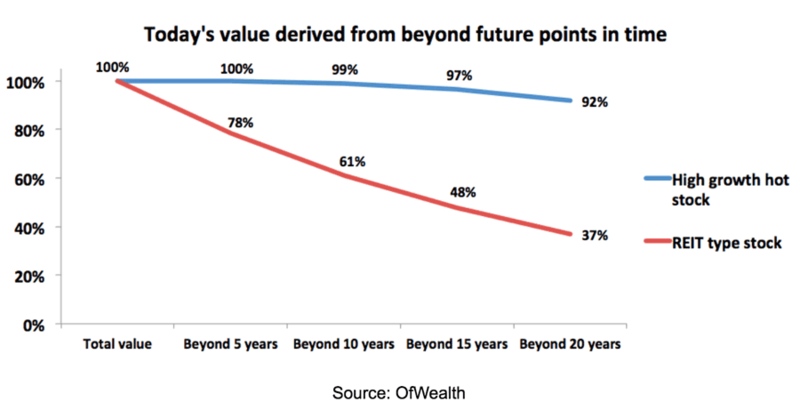 In such a case, 99% of the value is beyond 10 years and 92% is beyond 20 years! I’ve summarised the results from these two examples in a couple of charts. Here’s the one I included in Part I. Now you should be able to understand why it looks the way it does. You can clearly see the huge difference between the REIT and the high growth hot stock. Once you understand this, it should be no surprise that one of the best ways to lose money in stock markets is to overpay for fancy growth projections. It’s extremely high risk. 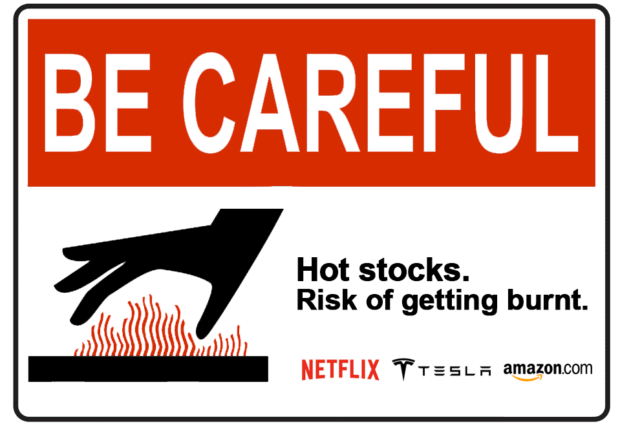 Too much can go wrong for these hot stocks over 20 years. That’s especially true in the world of fast-moving technology, with constant new entrants that have better products. Any premature slowing of hot stock companies’ growth prospects leads to calamitous and permanent stock price collapses. Maybe some investors think they can jump ship before it all goes wrong. But someone is always left carrying the can. Investors as a whole will still take the hit. The next chart shows the same information as the previous one, but breaking it down into blocks of time. For example, it shows how much of the value derives from the first 5 years of future dividends, the next 5 years, and so on to everything beyond 20 years into the future. I’ve given two simple examples of individual stocks. 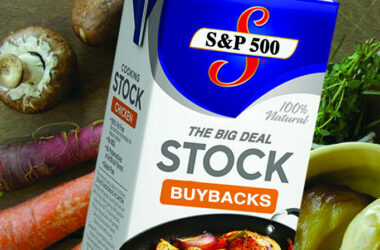 What about the value of a whole stock market index, such as the S&P 500? The distribution of value is somewhere in between, but much closer to the REIT end of the spectrum. This is why it’s a low risk move to buy into an oversold, diversified stock index immediately after a market crash. Most of the value lives far into the future, but excessive short term pessimism will have made the index cheap. After all, all the stocks in a country index rarely go bust at the same time (to say the least). Stock prices often reflect short term sentiment that completely ignores longer term values. From time to time, this provides excellent opportunities to buy stocks very cheaply (when price is way below value) or sell them when they’re not (when price is well above above value). High growth hot stocks, that pay no dividend today and rely on huge growth to justify their inflated prices, can have 90% or more of their value lodged far out into the future (beyond 20 years). For this reason they are extremely high risk. Picking good stocks to invest in is not about big stories. It’s not about investing in companies with familiar brands. It’s not about slick corporate presentations. It’s all about cold, hard cash. Specifically, it’s about how much a company will pay to its stockholders and when. Be a savvy stock investor, and act accordingly.